Every year I vow to reread the Bible. It is a book which never grows old, but is new every morning, and with each time through I understand something a little more. Or, I see something a little differently. I thought I would read the Chronological Bible this year, wherein the sequence is arranged not as one would find in the order of the Bible, but in the order of the events as they happened. There is a reading plan here, should you wish to see it, or better yet, follow along. I have chosen to read it in my King James translation, because the writing alone is beautiful beyond measure. But, the other thing I’m doing is writing down one verse from the day’s reading which seems to especially stand out in my heart. At the end of the year, I will have 365 verses to read in one continuous text, verses which highlight the year as well as His word as it spoke to me. For me, this is the most important reading I will do in all of 2015. I like the idea of writing down an especially significant verse from each day’s reading. I might have to give that a try. Love your idea of the single verse per day. What a lovely way to look back on a year, one I hope will be full of blessings. Wow. I love this. I need to do a project like this. I agree in the beautiful writing of KJV. 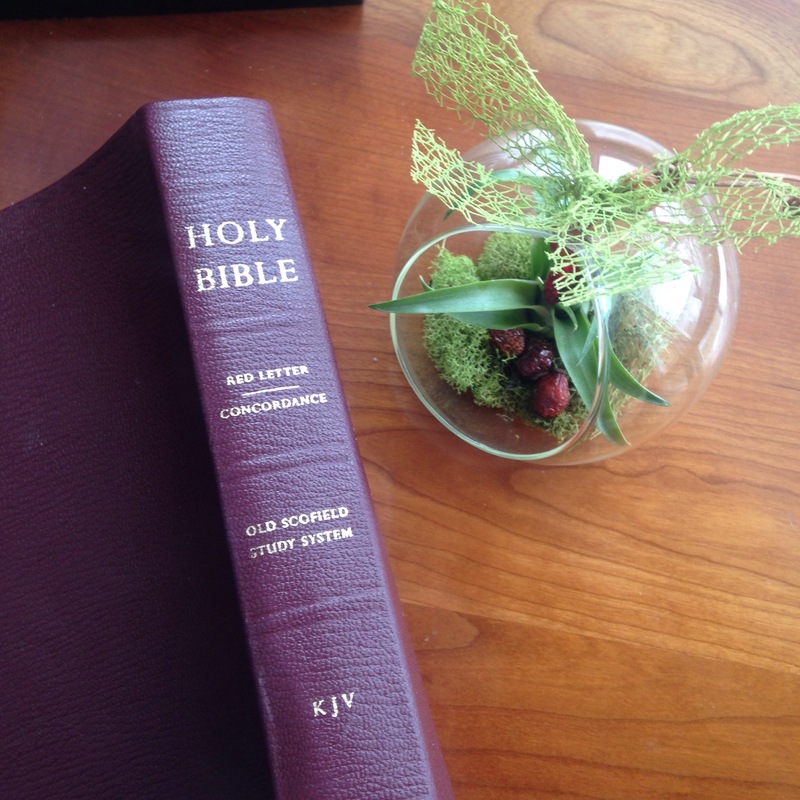 I heart my NLT but I often refer back to NKJV because of the gorgeous language. Especially in Psalms and Proverbs. I’m a KJV fan as well; I know some of the verse so well in KJV that they sound wrong in any other translation. 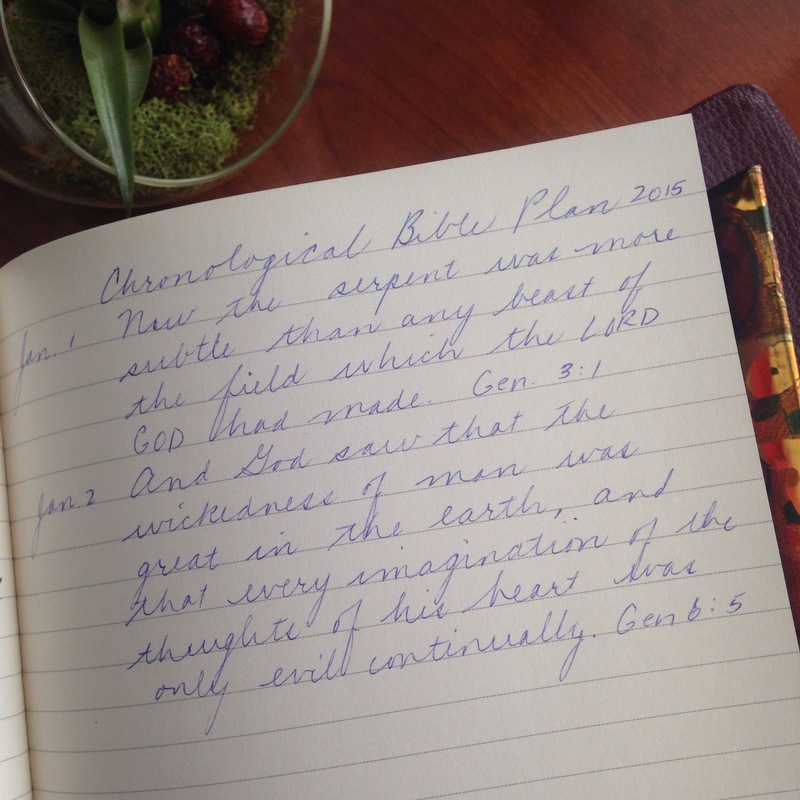 I started the Chronological plan a couple years ago and really liked it, but I lost steam when I got to the New Testament and never quite finished. Thank you for reminding me that I need to make it a priority again. A very good project. I read the whole The New Testament and Psalms once. My wife and I have made the same commitment to read through the bible this year. I have chosen the NLT version . Rather than writing down specific verses I am capturing intriguing thoughts that I may have missed in the past. What a coincidence! I was thinking just today that I should read some of the marvellous stories in the Bible. I had the idea once to read it from beginning to end, but I think it is better to choose the stories you want to read. I will have a look at your reading plan. This is such a lovely idea, Bellezza! And writing a verse a day will help you to remember and put the words into practice. Since you are reading Don Quixote the blog, Study Hacks, link below, can complement your reading. I admire your comittment DB, but I just find I loose steam in so many parts of the bible. I think also for me, the bible is filled with so many personal messages that I can sometimes feel overwhelmed by all the ‘learnings’. I would however like a bible verse to pop up in my email or on my phone each day – does anyone have a recommendation of where/how I can get that? I’m late to start! But, I just downloaded the Chronological Reading plan. It usually takes me 2 or 3 years to read through the Bible. Each time I try to read a different translation or a different something to put a new twist on it. I’ve never done a chronological reading. I’ll join you….but I think my goal will be for 2 years.